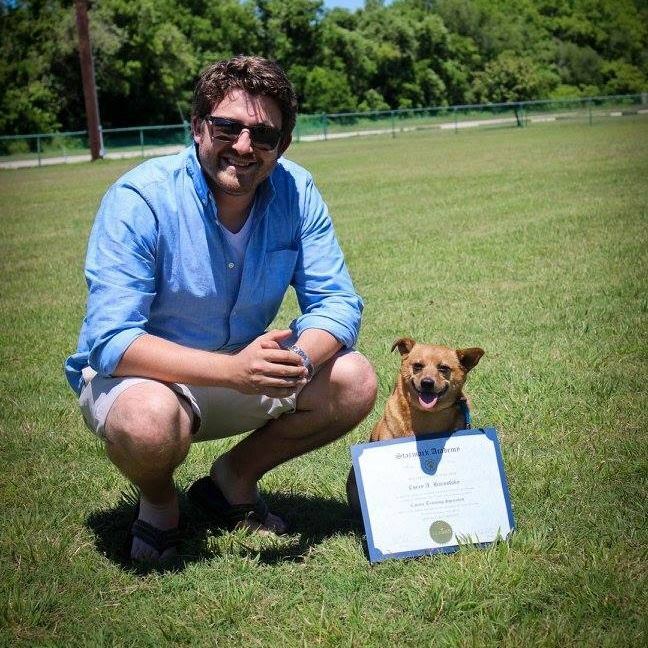 This photo was taken on the day Corey graduated an extensive dog training program from Starmark Academy in Hutto, Texas. Corey on Starmark graduation day, posing with the dogs of some of his fellow graduates. This is Daisy, a rescued American Staffordshire Terrier. She was assigned to Corey to work with during his time at Starmark Academy, and this photo was taken to help promote her adoption. She ended up getting adopted by one of his classmates and now lives in Illinois. Corey was born and raised on Long Island, New York, where he currently lives. He has been a dog lover all his life and currently has a 6-year old mixed breed dog named Murray, a rescue he adopted from North Shore Animal League in May 2012. Having always dreamed of owning his own business and working with dogs, Corey decided to quit his job and become a professional dog trainer. He enrolled in an intensive program at Starmark Academy, a renowned school for professional dog trainers, located near Austin, Texas. He holds a B.A. in psychology from The Ohio State University.